People who wish to reserve a name for their business in Tennessee must submit an application to the Secretary of State. This article discusses the application that should be sent in by anyone seeking a name for their limited liability company (LLC). This document is available on the official website of the state of Tennessee, in the section maintained by the secretary of state. If you wish to transfer a reserved name, you should file form SS-4234. If you wish to cancel a reserved name, you should file form SS-4226. The document does not need to be submitted with the articles of organization that formally create an LLC and can be submitted at any time. Tennessee Application For Reservation Of Limited Liability Company Name SS-4228 Step 1: The top section marked "for office use only" should not be filled in. 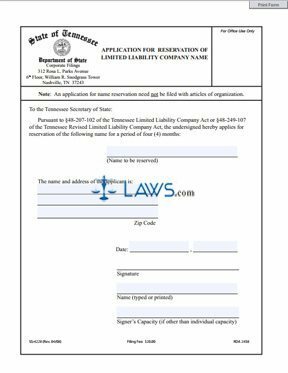 Tennessee Application For Reservation Of Limited Liability Company Name SS-4228 Step 2: Enter the name you wish to be reserved for your business in the space indicated for this use. Tennessee Application For Reservation Of Limited Liability Company Name SS-4228 Step 3: Give the full name, street address, city, state and zip code of the LLC on whose behalf you are filing. Tennessee Application For Reservation Of Limited Liability Company Name SS-4228 Step 4: Give the month, date and year on which you are completing the form where indicated. Tennessee Application For Reservation Of Limited Liability Company Name SS-4228 Step 5: Provide your signature where indicated. Tennessee Application For Reservation Of Limited Liability Company Name SS-4228 Step 6: Type or print your name where indicated. Tennessee Application For Reservation Of Limited Liability Company Name SS-4228 Step 7: If you are completing the form on behalf of a LLC which you do not have a stake in, note your relationship to the business above the line labeled "Signer's capacity (if other than individual capacity)." Tennessee Application For Reservation Of Limited Liability Company Name SS-4228 Step 8: The document should be submitted to the Nashville office of the Secretary of State. The address is given at the top of the page. Tennessee Application For Reservation Of Limited Liability Company Name SS-4228 Step 9: A filing fee of $20 should be submitted along with your application.